The only reason that one can think for the government’s continued insistence that the electoral bonds in their present form are transparent and electoral reform is that the BJP is the biggest beneficiary of such funding. Otherwise, any instrument that is sold payable to bearer without disclosing the name of the payer can never be transparent. The government harps on the fact that since the bonds can only be purchased through banking channels, they cannot be purchased with black money. Hence, they will reduce the use of black money in elections. But the government is ignoring the fact that if the name of the donor is not disclosed, if it is only known to the party receiving the funds, it opens the doors for corruption and quid pro quo. At present, political parties have to disclose the name of all donors who donate above Rs 20000 in cash or any amount by cheque. If a company donates Rs 2cr to any party, the party will have to disclose the name of the company to the Election Commission while the company will have to disclose the name of the party in its balance sheet. But if the donation is made through electoral bonds, the party will disclose it got the amount and the company will disclose that it paid the amount. But the party will not disclose the company’s name and the company will not disclose the party’s name. Is this transparency? Is this reform? Or is this invitation for quid pro quo? Even the claim that it will stop the use of black money in elections is not true. Companies in India operate through a maze of subsidiaries and shell companies. These shell companies are used by the parent companies to route shady transactions that will attract attention in the balance sheet. Thousands of these companies carry lakhs of crores in losses every year till the time such losses are adjustable with future profits as per the Income Tax Act. Promoters use these companies to convert their black money into white by showing profits in the current year and adjusting the past losses. If those transactions were shown in the parent company, they would have attracted additional tax. But in these shell companies, past losses can be adjusted to escape tax. The immediate offshoot of these transactions is that the shell company is now flush with funds. Most companies who wish to obtain favour from the ruling party without disclosing their names will now use this route to buy electoral bonds and fund the parties. Instead of reducing the use of black money, electoral bonds will, in fact, increase such use with a little bit of financial jugglery. The donors will now be ready to fund as it will be less risky and they will get income tax exemption as per law. Instead of telling the Supreme Court that electoral bonds are kosher, the BJP should admit that it has made a mistake. It should amend the provisions of the scheme to make it mandatory for both the party and the donor to disclose the names of each other in all reporting forms. Only then would the scheme would truly be reform and would perhaps reduce the use of black money in elections. 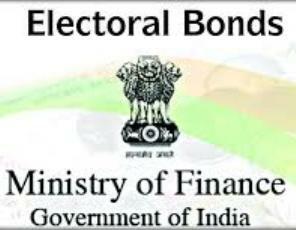 The BJP should also realize that as the ruling party, it is now reaping the benefit of these bonds. But if and when the opposition comes back to power, it will be the BJP that will be deprived of such funding. Further, the electoral bond scheme as it exists now is also making people wonder if the BJP is seriously interested in weeding out corruption in government. The government should immediately modify the scheme instead of waiting for the Supreme Court to deliver another stinging order against it.